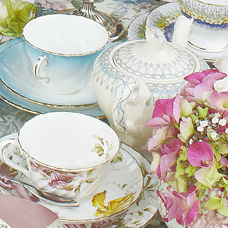 Vintage Crockery: teacups & saucers, teapots and coffee pots, side plates, sugar bowls and cream jugs to name a few! We offer a “hire-only” service or we can also help with your venue dressing and set up. This means that we can mix and match with your event plans and help you manage your budget. Please check out our Prices pages for more details or Contact us to discuss your requirements.